In October 1920, the Federal Government announced that it would assist commercial aviation by providing landing grounds at Sydney and Melbourne and erect the necessary buildings. The most suitable land in Melbourne was 93 acres (37.6 ha) of Harbour Trust land at Port Melbourne. However, the land was not available and, as aircraft operators were by now agitating for government action, the matter had become urgent. The Civil Aviation Branch of the Defence Department came into being on 28 March 1921. Of the four staff initially appointed, Captain Edgar Johnston, DFC (1896-1988) was made Superintendent of Aerodromes. 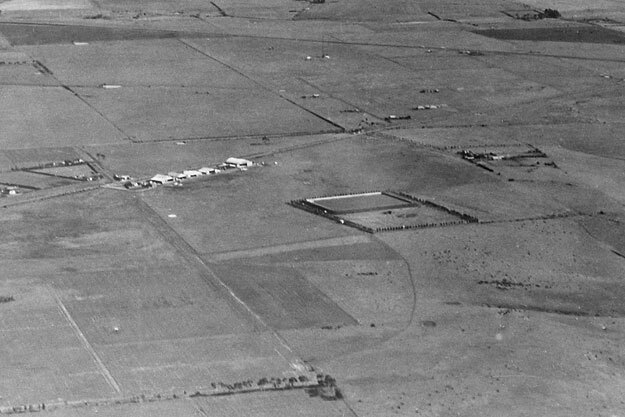 One of his first tasks was to select a government aerodrome site for Melbourne. He was to report on suitable sites within 10 miles (16 km) of Melbourne in the west and north-west environs where there was little, if any, housing. Captain Johnston made an aerial reconnaissance of the area on 8th March 1921, and his report of 14th May considered four possible locations. A Glenroy site was rejected due to the pending electrification of the railway line, which would have placed high voltage power lines along the western boundary of the aerodrome. Sites near the Broadmeadows Army Camp and at Albion were rejected due to their inaccessible locations, unsuitable ground surface and a poor train service. He recommended a rural site at North Essendon, known locally as 'St John’s' after an early pioneer, W.F.B. St John who purchased 516 acres (208.8 ha) of land in the area in 1843. Captain Johnston described the site thus: “An area of about 71 acres (28.7 ha) in the shape of an ‘L’ giving a dimension in any direction of 660 yards. The site is situated on Bulla Road, about 1¼ miles from the terminus of the Keilor Road tram and about two miles from Essendon Station. The train service to Essendon Station is exceptionally good, being every quarter of an hour during the slacker part of the day. The surface is very good, having a natural drainage in all directions, which would prevent the ground becoming boggy. Part of the area on the north east corner is under fallow and hence could not be used as a landing ground at present. Except for the removal of a fence, the cost of preparing the surface would be nil”. The purchase of the land was gazetted on 11 August 1921, as “land for defence purposes at Broadmeadows” at a cost of £5,472.7.6 (about $300,000 today) The irregular shape of the land was due to an MMBW (Melbourne and Metropolitan Board of Works) reserve for a planned reservoir to supply water to the western suburbs of Melbourne. 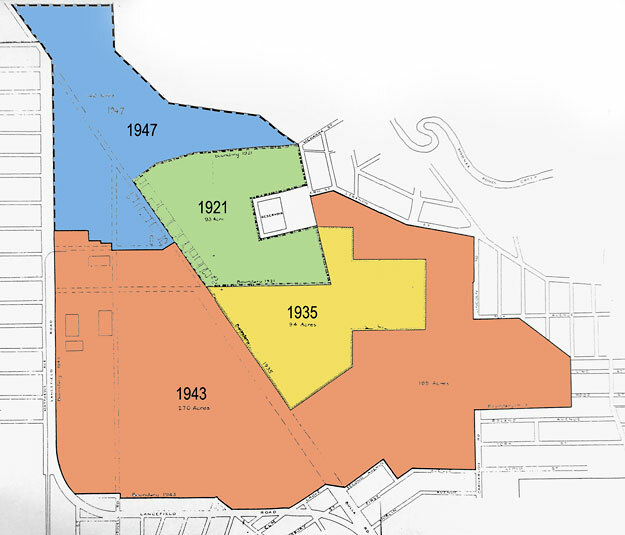 Below: This map shows the development phases of Melbourne's Essendon Aerodrome. The original land purchase is shown in green. The excised area for the MMBW reservoir can be clearly seen. The aerial photo above shows this section of the site, looking west. Roll your cursor over the image to highlight the original aerodrome land. The hangars were located at the south-western side of the aerodrome, along the Bulla Road. As purchased, the site was bounded by a combination of box-thorn hedge, post-and-rail and wire fences. The site was as basic as it could be with no running water, electricity, telephone or sewerage. The first task was to survey building sites, roadways and easements to permit the orderly development of the aerodrome. This work was undertaken by the Department of Works and Railways. From the beginning, there was the ever-present problem of filling potholes, leveling the ground and removing thistles. Contracts were frequently let to local cartage contractors with horses and grading equipment. Mr Taylor, from whom the land had been purchased, was allowed to graze horses on the aerodrome at night. The first tenant was the Larkin Aircraft Supply Company Limited, which had moved from Glen Huntly and now leased the hangar that the Civil Aviation Branch had purchased from Larkin, and had re-erected as the first building on Essendon. Others to follow soon afterwards were George Matthews (who had competed in the 1919 air race from England to Australia), Bob Hart, Harry Shaw and Arthur Schutt.